Borrowing to pay for your education? Make sure you’ll be able to pay off that debt. Check out Missouri’s top community colleges with the highest-paid graduates. Known for the tallest arch monument in the world — The Gateway Arch — Missouri is home to 42 2-year colleges, including well-known schools like Saint Louis Community College and Three Rivers Community College. 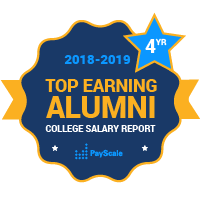 This report takes into account several different factors in terms of salary and career data for those who go on to earn their associate’s degree at a Missouri career college. Among the best 2-year colleges in Missouri by median salary data are Ranken Technical College, and Metropolitan Community College — Penn Valley Campus. Some of the top employers in the state include Wells Fargo Advisors, HandR Block, St. John’s Hospital and Anheuser-Busch Co. (the largest beer production plant in the country). Overall, it’s much more affordable to get an associates degree in Missouri — and while that doesn’t necessarily mean you’ll make as much, there are some great careers ahead for graduates from junior colleges across the state.